You can design beautiful knitting patterns quickly and easily with EnvisioKnit! Take your knitting designs further, faster with powerful charting tools. 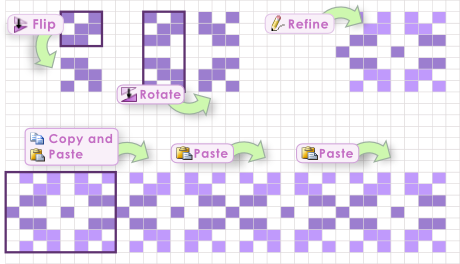 Draw stitches, flip and rotate motifs and visually copy and paste pattern repeats. If you change your mind, no problem - you can undo it instantly. EnvisioKnit does the dirty work, leaving you free to explore creative possiblities with a fraction of the effort! using clear, professional stitch symbols that visually represent the knitted fabric. EnvisioKnit's stitch symbols were designed to help you understand how your texture, lace and cable designs will look without reaching for your needles. You can easily customize all the stitch symbols to your preference. without having to redraw your design. See how your color choices work with your pattern. You can try out a new color scheme with just a few clicks. EnvisioKnit even has specialized color tools to help you find matching colors! using powerful tools specially created for knitting pattern design. Making a symmetric lace or cable pattern? Simply draw one side, and use the flip tool--you instantly have the other side. Unlike some other knitting programs, EnvisioKnit knows how to flip stitches to their mirror-image match, so your k2tog mirrors to ssk, and 1/2 RPC mirrors to 1/2 LPC. Use the visual paste tool to copy your new motif across your work, and you've got a pattern! 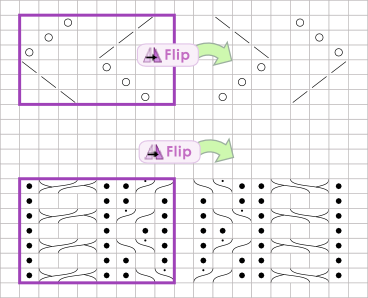 Let EnvisioKnit write your stitch patterns for you. 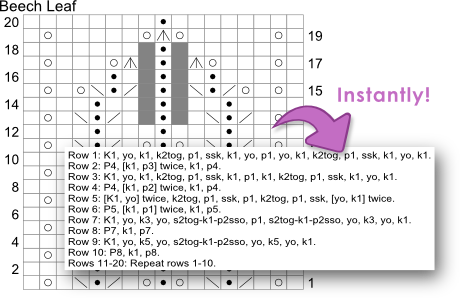 EnvisioKnit generates written knitting instructions for your charted pattern automatically. The software can find stitch repeats within rows and row repeats within the pattern to simplify your instructions. They will look like they were written by a designer, not a computer program. EnvisioKnit lays out your pattern automatically. 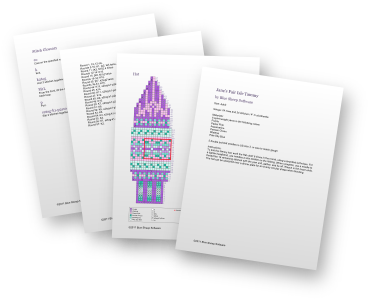 With the click of a button, you can produce a complete knitting pattern document with all your charts, an automatically generated stitch glossary and any additional summary information you want to add. Your pattern is always updated with your latest design changes, making the pattern revision process a breeze during test knitting. Export to Word or Open Office to tweak your layout further, or export to a vector format for total control. Choose the high quality pattern format that is right for you. Export your finished pattern to your format of choice. 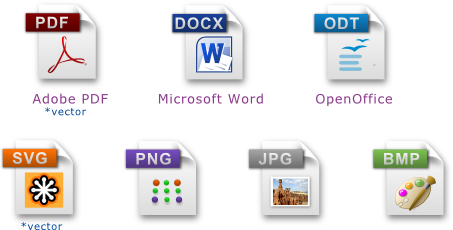 EnvisioKnit supports several vector, image and document formats. Vector formats are infinitely scalable and raster (pixel-based) formats can be exported with customizable resolution. Send us a message! Chat with us on Ravelry! We are committed to providing you with excellent support. If you have questions, comments, suggestions or need assistance, please feel free to contact us, we would love to hear from you! Create professional knitting patterns easily with EnvisioKnit Design Studio! EnvisioKnit Design Studio is a knitting software application that combines ease of use with unparalleled power and flexibility. It is accessible to beginners and invaluable to professionals. Join us in the EnvisioKnit Design Software group on Ravelry! One purchase entitles you to install on any computer you own. The chart editor makes creating knitting pattern charts a breeze. Draw freehand, or use the line, rectangle, fill, paste and flip tools. You'll be finished in no time. Produce professional quality, print-ready knitting charts with borders, legends and customizable grid numbering. The pattern preview updates your written pattern as you work on the design, translating your chart into written knitting instructions. It even has the knitting smarts to detect stitch and row repeats, simplifying your stitch pattern text! Export your design as an svg, PDF, Word, OpenOffice, png, jpeg or bitmap file. Print your design, share it with friends, or open it in a wordprocessor or graphics editor for full customization. Are you a Norton anti-virus user? You may experience difficulty downloading our installers. We submit every new release of our installers to Symantec for white-list approval, but this process can take up to a week to complete. In the meantime, if you are having trouble downloading, please see this page for a workaround solution to the problem. We apologize for the inconvenience. If you are unsatisfied with EnvisioKnit Design Studio for any reason, please uninstall it and contact us to receive a full refund within 90 days after your purchase. Copyright © 2019 Blue Sheep Software LLC.